Pregnancy hasn’t stopped Kourtney Kardashian from being stylish. She and beau Scott Disick hit hot spot STK with Kim and Khloe in Los Angeles last Friday as they tried to dodge the paparazzi. Kourtney rocked her off-the-shoulder dress with these H Williams’ “Rueda” black suede cut-out booties. PlazaToo.com, $558. Before quitting Twitter earlier this week, Miley Cyrus tweeted about her new Tubeflops by Sanuk. 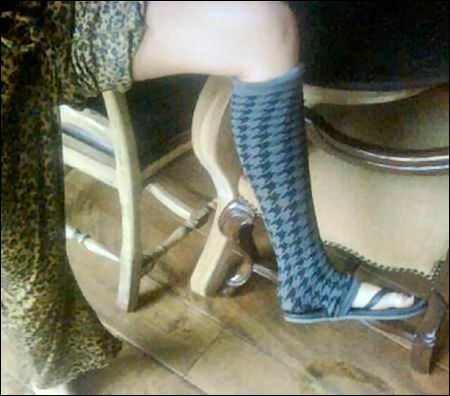 Yes, they’re flip flops with socks! Sanuk.com, $30. While filming an episode of The Hills, Audrina Patridge wore Rock & Republic “Nika” pumps with distressed jeans. RockAndRepublic.com, $275.